SCC will improve your bottom line, especially when high strength is an existing prerequisite. 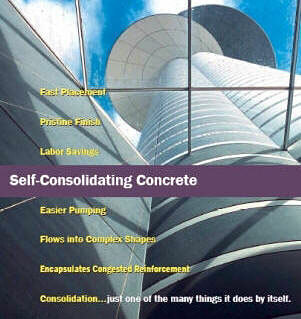 Labor and time are driving up costs for concrete producers and contractors. SCC places quickly and easily with little or no vibration to give a smooth surface finish. Save money by reducing the wear and tear of equipment and improve the working environment for employees. Achieve very high early stripping strength that will yield a quicker turnaround on your forms. The smooth surface finish will minimize or eliminate the need for time-consuming cosmetic repairs. Labor and time-to-completion are significant components of any job's economic picture. Since SCC flows easily, self-compacts and self-levels, placement is quick and easy, saving placement time, vibration time, labor, and equipment wear and tear. SCC's high early form stripping strength and smooth finish mean faster turnaround and minimal cosmetic repairs, and a positive impact on maintaining projects on schedule. SCC’s high cement content means that its economic benefits are amplified when high strength is a requirement. Plus, without the need for vibration, using SCC results in fewer safety and noise concerns.